If your dog has long, floppy ears and loves to swim in water, you might need to deal with him having an ear infection some day. Cleaning solutions and medications are available that will help clear an infection, and pain relievers such as aspirin can help make your dog more comfortable during treatment. Canine ear infections occur when bacteria or yeast builds up within a dog's ear. 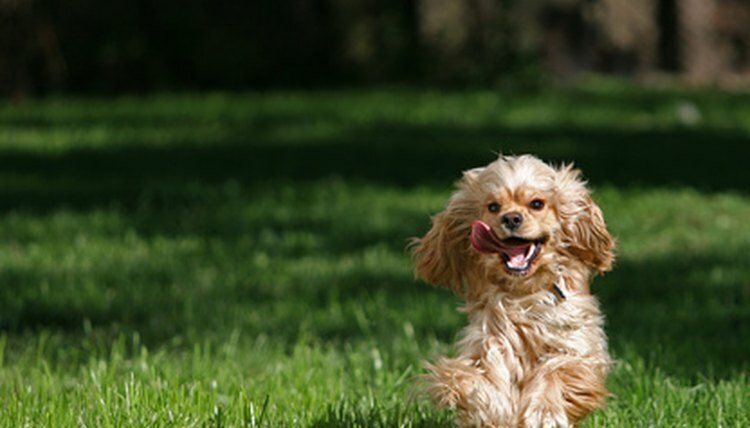 They develop most often in dogs with floppy ears, including poodles and cocker spaniels. Schnauzers and other dogs that have fur growing in their ears are also at risk for ear infections. If your dog has allergies, then it is at an increased risk for developing an infection, according to the American Society for the Prevention of Cruelty to Animals. Bacteria and yeast do not usually build up within a healthy, clean dog's ear. Ear mites can help trap bacteria and yeast within a dog's ear, as can a tumor growing in the ear canal. A foreign body like a piece of grass can lodge within a dog's ear, allowing water and bacteria to build up within the canal and leading to an ear infection. If your dog swims frequently, it could end up with water stuck in its ears, another cause of an infection. If your dog develops an ear infection, you might notice him scratching his ears often or rubbing his ears on the floor or on your furniture. The ear could be painful, so your dog might flinch away when you try to examine him. You could see discharge coming from the infected ear. The discharge will be brown or yellow and might be bloody or foul smelling. Severe ear infections in a dog can lead to balance problems, so your dog could lose its balance or walk around in circles. An ear infection in a dog can be treated with a professional cleaning by your veterinarian to clear away the infection and the bacteria or yeast causing it. After that, you can provide follow-up care for your dog at home by cleaning your dog's ears regularly and giving him medication, if necessary. If your dog is in pain, you can give him buffered aspirin on a short-term basis to provide relief. Because pain can cause a normally affectionate dog to become aggressive, do not attempt to force an ear cleaning on a dog that seems to be in pain. It is best to bring your dog to the veterinarian, who can sedate him for the cleaning process. If your dog has bloody discharge coming from his infected ear, talk to your veterinarian before giving him aspirin, because aspirin can sometimes make bleeding worse, according to "The First+Aid Companion for Dogs & Cats." Should a Guinea Pig Scratch a Lot? Are Elephant Ears Poisonous to Dogs?